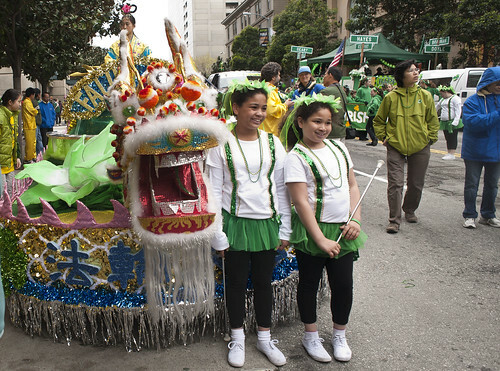 Two baton twirlers pose with a Chinese float at the 161st Annual St. Patrick's Day Festival in San Francisco, March 17. Photo by Sam Battles. Whether it was the fear of being pinched or the pure spirit of Irish culture, hundreds of people gathered alongside the streets of downtown San Francisco adorned in green feathered boas, sparkly shamrock sun glasses and “Kiss me I’m Irish” shirts, despite the cold and chance of rain fall. This was the 161st celebration of Irish culture in San Francisco with an annual parade and festival in the Civic Center Plaza. It happens every year on a Saturday. This time it luckily coincided with the actual St. Patrick’s Day, but the parade itself seems to attract the spirit of many cultures, not just the Irish. The parade consisted of various floats, performances and people who threw candy to the giddy children on the sidelines. It started at 2nd and Market streets and ended in front of the City Hall Building at Civic Center. This annual event brings together people of all ages and backgrounds to celebrate in the name of the Irish. “The one thing about the Irish is our sense of community, we’ve come from a long, long struggle, we’re an ancient people,” said James Bresnahan, chairman of the St. Patrick’s Day parade committee. Bresnahan is a member of The United Irish Society of San Francisco and has helped to put on the event for over a decade now. He holds pride in the Irish’s commitment to community, philanthropy and their great sense of humor, but he says that the inclusion of all kinds of groups in the parade is one of the most important parts. Participants in the parade come from all kinds of backgrounds such as Chinese marching bands and Mexican dancing groups. “The St. Patrick’s Day Parade to me is not just for the Irish, we share history with a lot of people,” said Bresnahan. The Irish Piper Band of San Francisco, who has lead the parade for over 60 years now, shares that same spirit of community. They invite people of all ethnicities to join their band for the love of the music. They have band members of Chinese, Turkish and Italian decent. Brendan O’Leary has been a member of the band since 1968. He could be seen playing the bass drum dressed in traditional Irish garb from his green kilt and hat, known as a glengarry. Deirdrah Gracie comes with her daughter and friends to enjoy the parade and festival every year. She likes the Irish dancers the best, but she also appreciates the the mixed gathering of people. “I think that especially in San Francisco there’s a lot of diversity, and it’s nice to be able to celebrate your own culture among them,” Gracie said.